So What Exactly is Kitchari? It is a combination of basmati rice with split mung beans, spices (appropriate for doshas), ghee or high quality oil and sometimes easy to digest vegetable components can be added to the dish making it like a rice stew. With the use of LTF's spices and ghee, the kitchari takes on a sattvic (peaceful) quality and reboots the digestive system without starving or undernourishing the body. There are numerous cleanses out there; water fasts, raw juice cleanses and so forth. An Ayurvedic internal cleanse using kitchari is exactly what you need to give your body the reboot it deserves without the harsh detox symptoms that usually accompany more aggressive fasting or cleansing techniques. If you are looking for something that won't break the bank, it's time to try a kichari cleanse. The process is simple enough to endure during the heat of Summer, as it is only three days - and it won't leave you feeling starved. If you are new to cleansing, then look no further than the traditional Ayurvedic Kitchari Cleanse by Love True Food. This cleanse can be done at any time of the year, usually in Ayurveda it is done between the junctions of the seasons. This is to clear any stagnant 'doshic' activity from the previous season. However, it is not recommended during a women's menstruation. Kichari cleansing brings the body back into homeostasis. According to Ayurveda, Kitchari is a whole food and when consumed with the appropriate spices, it can allow the body time to detox without overbearing with detox symptoms. In this ancient science of healing, kitchari alleviates symptoms of overly toxic and stressful lifestyles. 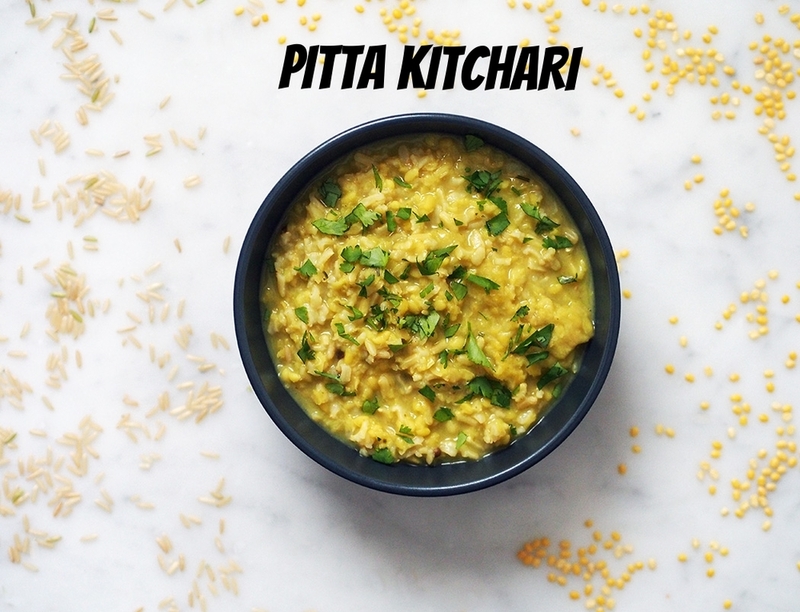 Kitchari is not only delicious, but it provides the body enough nourishment when undergoing a cleanse. It aids in digestion and regulates 'agni', the digestive fire within. A Kitchari cleanse can last from 3 to 21 days. It is usually best for the Vata type. There will be kichari for breakfast, lunch and dinner. Once your order is placed we will send you an e-booklet, What To Expect with a Kichari Cleanse, or you can download it for free here. We will also custom make your cleanse with some Ayurvedic herbs and supplements to get the full cleansing benefits. Whether you’ve opted for the three, four or nine day cleanse, it is generally safe for a range of imbalances and constitutions. Bear in mind that ‘any’ cleanse can be challenging because it not only deals with the physical body (with a few unpleasant detox symptoms like headaches, body aches, irritability and exhaustion), but also the mind and emotions. Seeing as this is a very gentle cleanse, it should not cause a great deal of discomfort, however there may be some times where challenges can arise, especially if you are detoxing from an extremely stressful lifestyle. Before the actual cleanse it is important to limit dairy, sugar, caffeine and gluten from your diet to ensure that physical detox symptoms are kept to a minimum. For most people, cleansing with rice and beans seems a little weird because in a Western dietary perspective raw juices are usually used. 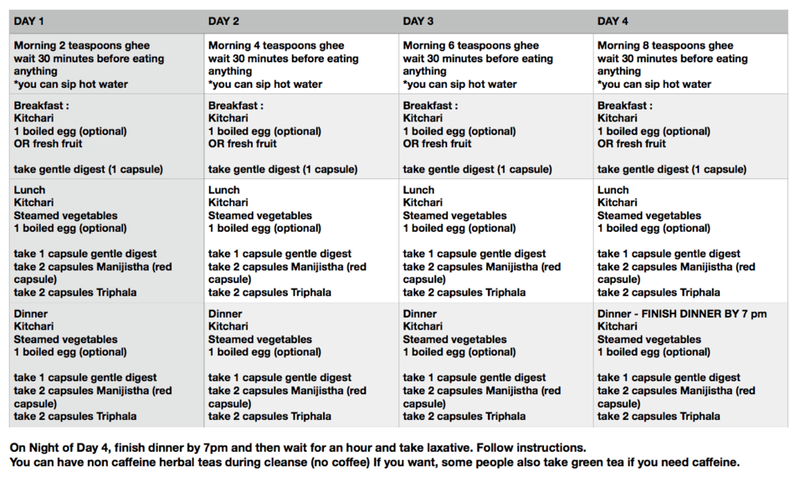 However in the Ayurvedic approach kichari is easy to digest so can help even more with supporting the detox. 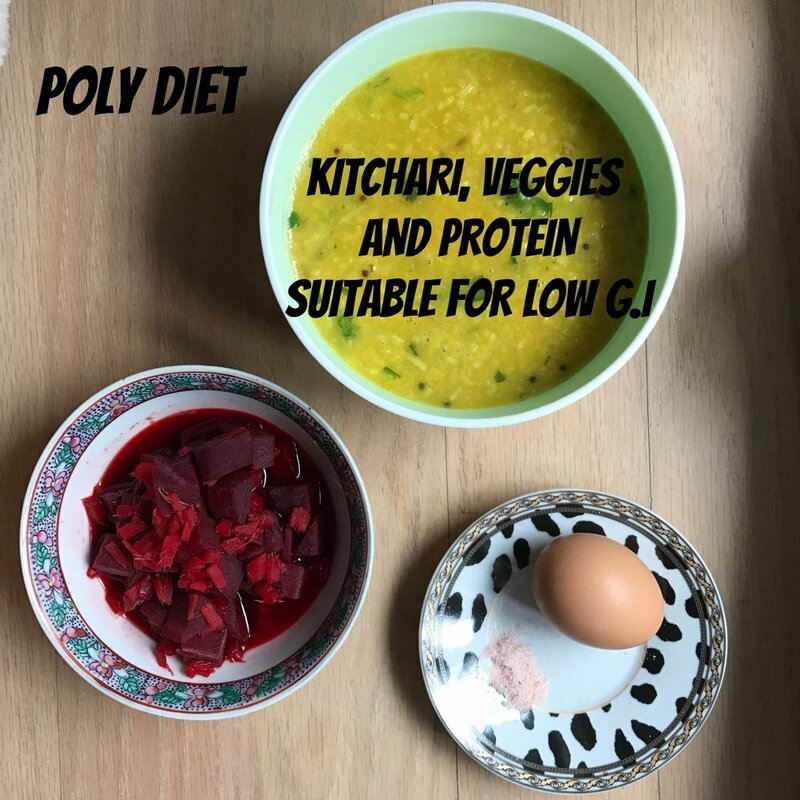 The purpose of a mono-diet of kitchari is to give the body only one thing to digest, this allows the body to regulate the natural rhythm of digestion, basically a big rest. View our body as a car, we need to service and re-condition it to improve its functionality. In the same way we can condition our bodies with a kitchari cleanse. During the cleanse you will start the day with ghee, then 30 minutes after an oatmeal and/or kitchari. This diet is more than enough for you to get on with your daily duties without collapsing into a heap. It will reset the digestive system and support the elimination of toxins from the bowels. (It is better to allow elimination out of the bowels than skin). This cleanse is balancing to all doshas, vata, pitta and kapha. Fresh meals are always preferred in Ayurveda, so we will deliver your meals daily for the whole day. Try to avoid eating leftovers from pervious days. We will provide herbs for you; In Ayurveda we include all six tastes into one meal to optimise digestion- sweet, sour, salty, bitter, astringent and pungent. This kitchari has all tastes. This will be tailored in your kitchari cleanse. WHAT HAPPENS IF I AM CONSTIPATED? A supportive cleanse will clear excessive doshas- vata, pitta and kapha and toxic buildup known as ‘ama’ from the system using the organs of elimination (namely urine, sweat and feces). These channels need to be kept open and running smoothly throughout any cleanse to ensure toxins are not re-circulating around the blood stream. take psyllium husk or chia seeds with your warm water for more bulk. For most people , these measures should work just fine, however if you find yourself still constipated, consult your health care provider. In general, you can eat enough kitchari to feel satiated but not to the point of exploding (my grandfather always used to say, eat until you can still fit in half a burger into your stomach, you get the point!). This will vary for different people, but in general, you will ‘know’ when you feel satiated. eat simple kitchari or oatmeal for breakfast. you can garnish your kitchari fresh cilantro or sesame seeds. drink at least 8 to 12 cups of room temperature water or herbal tea each day- this will help flush out the toxins. (non- caffeinated beverages best) This classic digestive formula will help to burn up the excess moisture of kapha, an excellent choice for cleansing. It is tri-doshic, meaning it is balancing for all doshic types, in all seasons. The digestive herbs stimulate the agni or digestive fire, making it an excellent digestive. Take ghee (2,4,6,8 tsp, depending on the day). sip- 1 to 2 cups of hot lemon water to cleanse the system and wake up the digestive fire. take one packet of kitchari or oatmeal and follow recipe. It cooks within 35 to 40 minutes. Please complete full address and let us know if your building has any staircases. The delivery will be made the evening before your cleanse. Keep the kitchari in the fridge and heat up for the days. If you are on a longer cleanse, we will deliver every 3 days. If you know your dosha, you can select the dosha below for a more specific cleanse. If you are unsure, please select general. Please select the duration you'd like to cleanse for. 4 days is popular. Please let us know if you have any special requests, we can make our kitchari vegan and without certain spices. Please select the date you would like to start the cleanse. Please note that we need 48 hours for delivery.